The lava flow towards the Taniluya canyon is 200 m long and produces small incandescent rockfalls. A weak glow was observed from the crater at night. INISIVUMEH mentions no explosions.  The lava flow towards Taniluyá canyon is reported to be 150 m long, which would mean it has strongly decreased over the past few days (from 500 m). The second lava flow towards Ceniza canyon is still active as well. Activity has not changed since yesterday.  Strombolian activity and two active lava flows about 400 m long are recorded. Most activity is the effusion of the lava flow, now about 300 m long, to the east towards the Taniluya canyon, and frequent incandescent rockfalls from its front. The volcano produces occasional strombolian explosions ejecting incandescent blocks to about 100 m and producing ash plumes of 100-400 m height. The lava flow is reported to be 250 m long in the latest update from the volcano observatory. Activity has not changed much at Fuego. 13 weak to moderate strombolian explosions with ash plumes to 200 – 400 meters height, hissing gas venting at intervals of 1-8 minutes, and a 200 m active lava flow shedding constant rock avalanches were reported in the last daily update (note that the previous day, the lava flow was said to have been 300 m long - either the figures are a bit indicative, which is normal, or the flow has decreased a lot since yesterday). The seismogram shows lots of activity as usual. INSIVUMEH reports 8 weak explosions so far, and a slight advance of the lava flow towards the Taniluyá canyon, accompanied by numerous rock avalanches. The lava flow towards Barranca Taniluya is active and reaches 200 meters length, producing small avalanches. 3 explosions were counted by the observatory yesterday and reached heights around 400 m.
The lava flow toward Taniluya Canyon remains active, but has become shorter (currently 150 m). INSIVUMEH lists 7 weak explosions in the report from 8 Aug, which produced ash columns rising 200 m, accompanied by rumbling noise and degassing lasting between 1 to 5 minutes. In a special bulletin on 3 August, INSIVUMEH reported a new phase of activity at Fuego, characterized by increased seismicity and degassing sounds. Incandescent tephra was ejected 200 m high and a lava flow traveled 500 m down the SW flank into the Taniluya drainage. Pyroclastic flows likely descended the SE and SW flanks. During 4-7 August explosions produced ash plumes that rose 200-400 m above the crater and drifted NW and W. Lava flows traveled 250-300 m down the Taniluyá drainage. Detached blocks from the lava-flow front traveled down the flanks to the vegetated area. Blocks also traveled down the Ceniza drainage (SSW). At night during 5-6 August explosions ejected incandescent tephra 100 m above the crater. Ash plumes from these explosions drift for about 10 km mostly in westerly directions. The lava flow in direction of barranca Taniluya is still active and 250 m long, and sheds incandescent blocks rolling down from its front to the vegetation line. The lava flow towards Taniluya valley is active and has a length of 200 m.
Seismic activity is at moderate levels. The explosions ejected incandescent material to heights of 100 to 150 m above the crater and generated weak avalanches on the upper crater flanks with rumbling and jetting sounds. Weak glow is seen at the crater at night. Seismic activity recorded at Fuego volcano suggests another significant outburst occurred at that volcano late yesterday 27 June. INSIVUMEH reports 6 weak ash emissions and 3 strombolian explosions ejecting glowing bombs up to 150 m.
Fuego volcano continues to produce lava flows and strong strombolian explosions, and CENAPRED and CONRED warn about possibly pyroclastic flows that could be generated by collapsing lava flow fronts and incandescent material rolling down the steep upper slopes of the volcano as has occurred before during the ongoing strong eruptive phase. It is therefore recommended not to stay within canyons in the vicinity of the volcano. The CONRED system maintains constant monitoring. During 6-7 June explosions produced ash plumes that rose 200-500 m above the crater and drifted N, and 12 km S and SW. Lava flows on the SE flank were about 800-900 m long in the Las Lajas drainage, 600 m long in the El Jute drainage, and 250 m long on the SW flank, and produced blocks that rolled and reached vegetated areas. The explosions were accompanied by rumbling sounds and shock waves that were detected in areas 10 km away, including Panimaché and Morelia (~8 km SW). Seismic data suggested that on 25 May lava was emitted in the crater, although lava flows were not observed the previous few days. Plumes rose 2 km above the crater and drifted SE, SW, and W. Ashfall was reported in Sangre de Cristo (8 km WSW), Yepocapa (8 km WNW), and in the department of Chimaltenango (21 km NNE). A pyroclastic flow traveled SW down the Las Lajas drainage.